One week into the 2019 legislative season, lawmakers from 11 states have already submitted 30 bills to address the rising cost of prescription drugs. The bills submitted to date seek to implement wholesale drug importation programs, increase pharmaceutical pricing transparency, and regulate pharmacy benefit managers (PBMs), along with other drug cost containment initiatives. Last year, nine states introduced legislation to either study or implement wholesale drug importation, and Vermont became the first state to pass an importation bill. This year, Colorado has reintroduced a bill that would require its Department of Health Care Policy to design a wholesale importation program, and Missouri also reintroduced a bill to study importation. Requiring transparency into dramatic price hikes to understand better prescription drug pricing is also expected to remain an area of interest for state lawmakers. In 2018, five states enacted laws that require pharmaceutical manufacturers, PBMs, and health plans to share information behind prescription drug costs and their increases. A newly proposed bill in Texas would require greater pricing transparency for essential diabetes medications, following in the footsteps of Nevada, which passed a similar measure in 2017. One of the most popular, bipartisan drug pricing legislation passed during the last session was regulation of PBMs. More than 90 PBM bills were introduced last year with 20 states enacting 31 of them. In October, following the legislative precedent taken by dozens of states, Congress passed legislation to prevent gag clauses in PBM contracts to allow pharmacists to share pricing information with consumers. While the prohibition on gag clauses now applies throughout the country, states continue to explore innovative ways to contain costs within the drug supply chain. During the new 2019 season, eight states have filed 16 bills focusing on PBMs. In Montana, legislation would regulate the way health insurers contract with PBMs to prevent spread pricing — a payment model that allows PBMs to profit by charging insurance plan sponsors more for a prescription than the PBM pays the dispensing pharmacy. The lack of transparency in the spread-pricing model makes it difficult for states to identify how much spread pricing contributes to their overall drug costs. Montana’s proposed legislation is designed to lower health plan premiums for consumers. With 46 states convening their 2019 legislative sessions and 13 states already introducing bills to curb rising prescription drug costs, clearly this a top priority for many state lawmakers. This is not surprising, in 2018 state lawmakers filed more than 170 prescription drug cost containment bills, with 45 enacted. Drug prices were frequently mentioned by state and national candidates during the 2018 midterm elections. As national attention on drug prices expands, states will continue to explore solutions to curb the rising cost of pharmaceuticals. The National Academy for State Health Policy (NASHP) will continue to track state’s prescription drug cost bills as they are introduced, enacted, and implemented. 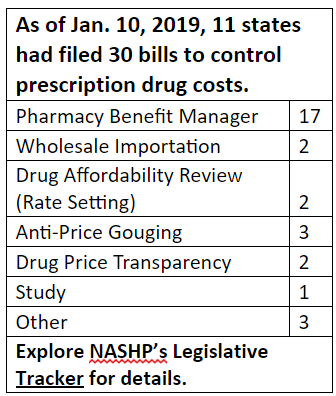 To learn more about each state’s drug cost containment bills, explore NASHP’s Legislative Tracker.